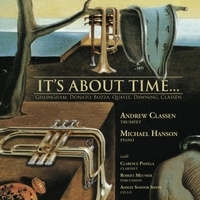 Classical Trumpet, Solo and Chamber, with some crossover into jazz improvisation. 25 years ago, I received my undergraduate degree and went on the road with the national touring musical. After more touring, freelancing in Minneapolis, then completing my Masters degree, I was hired at Drake University. I’ve play in almost every situation that calls for trumpet. I taught many fine trumpet students, five of which earned doctorates and are college trumpet teachers themselves. My solo, jazz and orchestral performances have been broadcast on radio and TV. But, I have seriously procrastinated producing a solo CD. So, a couple of years ago, I decided: it’s about time. Micheal Hanson, a form Drake student that is completing his DMA at Indiana Universit, agreed to collaborate with me. I picked a varied repertoire of music not recorded (to my knowledge). The two chamber pieces were written and performed with my Drake colleagues. Bozza Caprice No. 2 is less performed than the first, but is featured in SmartMusic. It has the signature triple tonguing fanfare motive of Bozza’s brass works, but adds a physically demanding lyrical section that exploits the trumpet’s upper register. It ends with a light but challenging section that has scherzo qualities. I first heard portions of the Gillingham Sonata for Trumpet and Piano at a new music recital at the International Trumpet Guild Conference. Upon preparing the entire piece, I gained a respect for the physical and musical demands for the composition. This is the most challenging piece I have ever played, but I feel the musical results are worth the effort. I hope you enjoy the piece as much as I. The Anthony Donato Prelude et Ballade is a piece I have taught to advanced high school students due to its atonal nature. I had assumed it was written by an Italian composer as a French contest piece, since it was published by LeDuc. After a bit a research, I learned the composer was born in Prague . . . Nebraska! He taught at Drake University in the 1940’s before settling into a position at Northwestern University. Sui Generis was written for me by one of my most remarkable students, Melody Dawning DeVos. She is currently working with David Gillingham on a Masters of Composition at Central Michigan University. When I first saw the piece, I told her I couldn’t play it. She told me that I play that material every day, and she was right. It starts with the trumpet playing into the piano with the damper pedal down to allow the strings to resonate the trumpet pitches. It then moves into a latin/jazz section with some serious upper register demands. It ends in the same calm from the beginning. Matthew Quayle wrote his Introduction and Fanfare at the request of Drake’s cello professor, Ashley Sidon, for our tour of China in 2010. It is an engaging piece for an unusual combination of trumpet, clarinet and cello. The final piece I wrote for my dearest friends and colleagues at Drake, Bob Meunier on marimba, and Clarence Padilla on clarinet. The Waveland Suite was first performed at the West Coast Clarinet Conference in Mexico in 2009. It’s excellent reception there led to two years of the group performing and teaching at the National Conservatory of Music in Mexico City.